1. Points of Entry 2. The Beginnings of American Popular Music. 3. The Emergence of Black Music. 4. Popular Song in the Modern Era. 5. The Swing Era. 6. In from the Outskirts: Blues and Black Gospel 1925-1950. 7. In from the Outskirts: Country and Folk Music 1925-1950. 8. Latin Music in the United States: 1900s-1950s. 9. 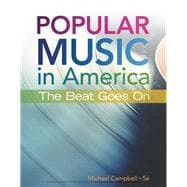 Popular Music Matures: Musical Theater, Modern Jazz, and Song Interpretation. 10. Rock and Roll. 11. The Rock Revolution. 12. Latin Music 1950 to the Present. 13. Rock and R&B in the Early 1970s. 14. New Trends of the Late 1970s. 15. Country Music in the Rock Era. 16. Electronica and Rap. 17. Beyond Rock: the 1980s. 18. Alternatives. 19. A World of Music. 20. Popular Music in the Twenty-first Century.